It used to be easy to choose an iPad. There was one model, perhaps two, and all you needed to choose was the color and how much storage you wanted. Oh how things have changed! Nowadays, you have multiple options to choose from, each with varying configurations; it's not so simple to know right off the bat which iPad is best for you. If you want an iPad today, there are five different models, each with different feature sets. There are three different sizes, and the price varies from as low as $269 to as much as $1,099 (and that’s without any of the accessories that make the new iPad Pro models interesting). You have options for Wi-Fi, or cellular and Wi-Fi, and from two to four color options, depending on the model. Altogether, there are 77 possible iPad configurations; as you can see, it's far from simple to choose the one you need. Based on your needs, how can you tell which iPad you should get? In this article, I’m going to take a look at the different iPads, and recommend which iPad is best for you, depending on how you plan to use it. If you do a lot of work on your iPad, you definitely want the iPad Pro; either the 9.7” model or the 12.9” version. These are the latest, fastest, most capable iPads, and they offer Apple’s new Smart Connector to use the Smart Keyboard. Unfortunately, this keyboard/cover isn’t cheap: $149 for the smaller model, and $169 for the larger one. The larger iPad boasts impressive qualities: It's got lots of room for you to work comfortably, with text, spreadsheets, graphics, and more. With the iPad Pro, you can also use the Apple Pencil ($99). This stylus is great if you draw, take notes, or edit photos. The Apple Pencil is really an amazing tool, and if you have an iPad Pro, you should get one. Some people think that taking photos with an iPad is gauche, but lots of people do it. If you carry your iPad around with you, and want to take photos, the 9.7” iPad Pro has the best camera. While the 12.9” model has an 8-megapixel camera, the smaller, more recent iPad Pro sports a 12-megapixel camera. It’s also got a larger aperture (f 2.2), which means you can shoot photos in less light. And it supports Live Photos and True Tone flash, both useful features if you take a lot of pics. The 9.7” iPad Pro is also the only iPad that can shoot 4K video, and it can shoot slow-motion video at 240 fps. If you take lots of photos with your iPad, the 9.7" iPad Pro is a great choice. If like to play iOS games—and I don’t mean solitaire—then you definitely want an iPad Pro. With the latest A9X processor, these models have desktop speed, and the graphics are astounding. Be aware that some games take up a lot of storage, so don’t go for the default 32 GB model; pay the extra money to get at least 128 GB, or even 256 GB, only available on the iPad Pro. You may travel a lot, and use your iPad to carry around movies and TV shows to watch on the road. If so, you need lots of storage. As I said just above, only the iPad Pro offers more than 128 GB storage. 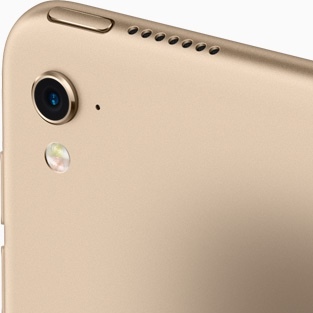 You can get 256 GB on both Pro models, while the iPad Air 2 is limited to a mere 64 GB. 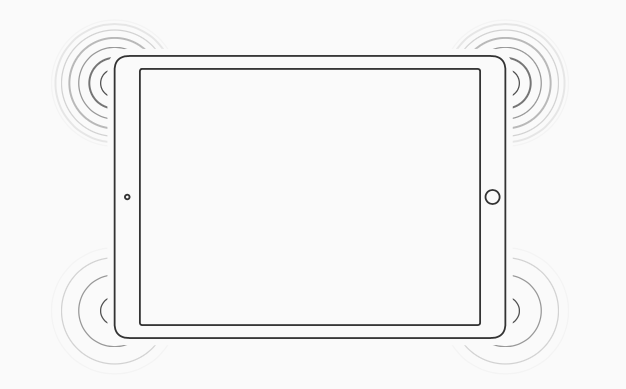 The iPad mini 2 only reaches 32 GB, making it a very limited device. This is easy; the $269 iPad mini 2 is at the bottom of the price table. But beware: that’s the 16 GB model, and there won’t be a lot of free space left after you install iOS and a few apps. But if you only need an iPad for occasional use, or you want to discover Apple’s tablet, this might be a good place to start. Note that you can find refurbished iPads on Apple’s websites, and you can buy used models on eBay, so if price is key, you may want to choose a better model from one of those channels. I have the 9.7” iPad Pro, and I love watching movies and TV shows on it. The display is crisp and responsive, and the four speakers sound good enough that I no longer use headphones, at least if I'm watching alone. There’s a sort of faux surround sound on these devices, but it doesn’t sound artificial; it makes movies sound vibrant. Both iPad Pro models have these additional speakers, and if you watch videos, and want to eschew headphones, this sound system makes it possible to do so. You’re in luck: All iPad models offer a cellular option. It’s not cheap, though; add $130 in the US to be able to access data on the go. If you have an iPhone, and your carrier lets you set up a personal hotspot, that’s a great way to get data to your iPad or laptop when you’re on the road. It’s taken a while for Touch ID to be added across the iPad product line, and now, only the iPad mini 2 doesn’t have that feature. You need Touch ID to use Apple Pay, and if you do want to use that payment system, you can use any of the other models. 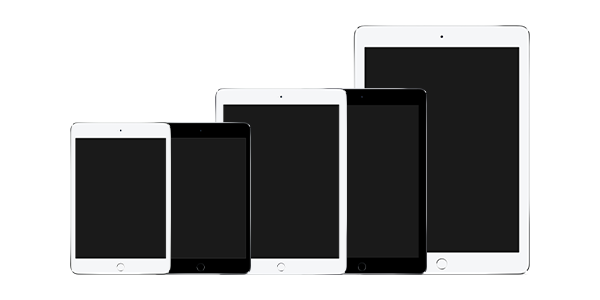 There are three sizes in the iPad product line: the 12.9” iPad Pro, the 9.7” iPad Pro and iPad Air 2, and the 7.9” iPad mini 2 and iPad mini 4. If you want the biggest one, it’s clear which you should choose. For the other sizes, I strongly recommend buying the more recent models (iPad Pro or iPad mini 4). The others won’t last as long, as new versions of iOS are released they will become incompatible sooner. But if you do want a light, compact iPad, the iPad mini 4 is a great choice. It's got an excellent display and it's fast enough for most needs. Oddly enough, the iPad product line isn’t very friendly to those who use apps like FaceTime and Skype to chat with their friends and families over video. Only the 9.7” iPad Pro comes with a 5-megapixel front-facing camera; all the others have schlocky 1.2-megapixel cameras. If you plan to use your iPad often for video chats, think how you’ll look to others with the cheaper front camera. No one iPad is perfect for everyone. You may find that some of the above use cases match your needs, and others don’t. You may want the features of the biggest iPad Pro, but not the price. So have a look and see which model comes closest to your needs. And don’t forget, there will probably be a new iPad in the fall! This entry was posted in Apple and tagged iPad, iPad Air 2, iPad mini 2, iPad mini 4, iPad Pro. Bookmark the permalink.